The Faith Camp Staffternship is a hands-on service and learning opportunity for 18-24 year old individuals at any point in their high-school, college, or post-graduate career. The servant leaders who occupy this unique role serve as both interns and as Faith Camp staff alongside the individuals who serve in the typical staff role. All Staffterns must have a servant’s heart, be devoted to the ministry of Faith Camp, exhibit enthusiasm for junior high ministry, strive for and maintain a well-founded personal prayer life, and must possess a personal commitment to the teachings of the Catholic Church. Prospective applicants should read this description in its entirety. All applications will be processed by the Faith Camp Coordinator team. In addition to completing the application, you are required to have one letter of recommendation submitted on your behalf before the application deadline. If you have staffed with us in the past three years, the letter of recommendation is optional. It is best if you ask this individual to write your recommendation early, even before you submit your application. No late applications will be accepted. The Staffternship begins part-time upon acceptance to the program. When accepted, Faith Camp Staffterns are expected to work a minimal five hours a month remotely; it then begins in earnest on June 14th where Faith Camp Staffterns begin their Stafftern formation. From that date through the end of Faith Camp on July 26th, Staffterns will be living in community full time. When living in community, Staffterns will have a few personal days during the six weeks of their commitment. For the remainder of that time, however, Staffterns are expected to join in the community life formed by other Staffterns and the Faith Camp Coordinators. Meals will be eaten in common, and a guys and girls space will be the living quarters at the old Camp Woodmen facility. All Faith Camp Staffterns are expected to have a spiritual support base who will support them in their ministry through prayer and fasting. Additionally, Staffterns are encouraged to find a financial support network for their ministry. Faith Camp will provide fundraising materials and a fundraising platform to each Stafftern to help him or her in the fundraising process. Staffterns are asked to raise no more than $3,250 for their commitment to Faith Camp (any money raised in excess will go to Faith Camp’s operational fund). Donations will be held by Family Missions Company until June 14th, at which point each Stafftern will incrementally receive the donations that (s)he has raised as a stipend (up to $3,000). Each Stafftern’s support base make it financially viable for that individual to serve in this role. Note: If any Stafftern should withdraw from the Staffternship program before (s)he fulfills his or her role, the funds that (s)he raised will be kept by Faith Camp, as they were donated to support this ministry. To be clear, any Stafftern who withdraws from the program will not receive the funds (s)he raised, as these will be donated to Faith Camp in their entirety. One guy will be chosen to serve as the Apostle to the male Disciples and Team Leaders during the weeks of Faith Camp. This individual must exhibit leadership, supervision, and exceptional interpersonal skills. Strong preference will be given to applicants who have attended Faith Camp in the past, and who exhibit an understanding of this role’s importance in camp. One girl will be chosen to serve as the Apostle to the female Disciples and Team Leaders during the weeks of Faith Camp. This individual must exhibit leadership, supervision, and exceptional interpersonal skills. Strong preference will be given to applicants who have attended Faith Camp in the past, and who exhibit an understanding of this role’s importance in camp. Write this year’s theme song, lead music ministry practices, and select the songs for the weeks of camp. Lead all praise and worship during Faith Camp and Staff Retreat. This position may also serve as a cabin leader. Serve in music ministry under the guidance of the Lead Music Minister. 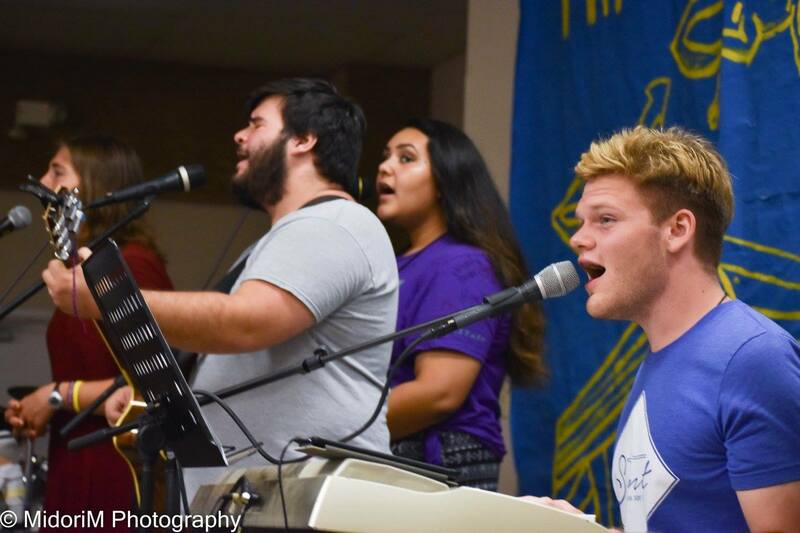 Attend practices and guide praise and worship during Faith Camp and staff retreats. This position may also serve as a cabin leader. Take photos and video during the weeks of Faith Camp, videotape the Program dance, and be available for any other Faith Camp events. This position may also serve as a cabin leader. This individual must provide his/her own camera and video equipment. *Applicants to this position must upload 5 sample images and a 30 second sample video with application. Create social media content for Faith Camp’s social media outlets, oversee technical responsibilities during the weeks of camp, assist in editing and posting photos and videos post-camp. This position may also serve as a cabin leader. *Applicants to this position must upload 5 sample images and a 30 second sample video to the application. Design skits for Faith Camp and direct them during camp. Create and oversee program games. Aid in the creation and oversight of activity programming during the week. This position may also serve as a cabin leader. Assist the head coordinator(s) of camp. Field phone calls, run errands, keep schedules, and ultimately serve to aid the coordinators throughout the week. Must maintain confidentiality. Preference given to those who exhibit organizational and interpersonal skills, and who feel comfortable speaking with parents and volunteers via phone or in person. Oversee medical supply organization and distribution before and during camp. Be present to assist in the distribution of medicine at key times. Be prepared to help in the case of medical incident or accident. Serve as the camp’s medical volunteer on site. This position must have some medical experience or training (nursing or medical student encouraged; CPR or EMT experience acceptable; etc.). Serve as the welcoming face of camp. Welcome volunteers, screen and accept visitors, facilitate check-in and check-out, and maintain a spirit of order in communal areas of camp. Oversee setup and cleanup at meal times. Work closely with volunteer teams, apostles, and coordinators.